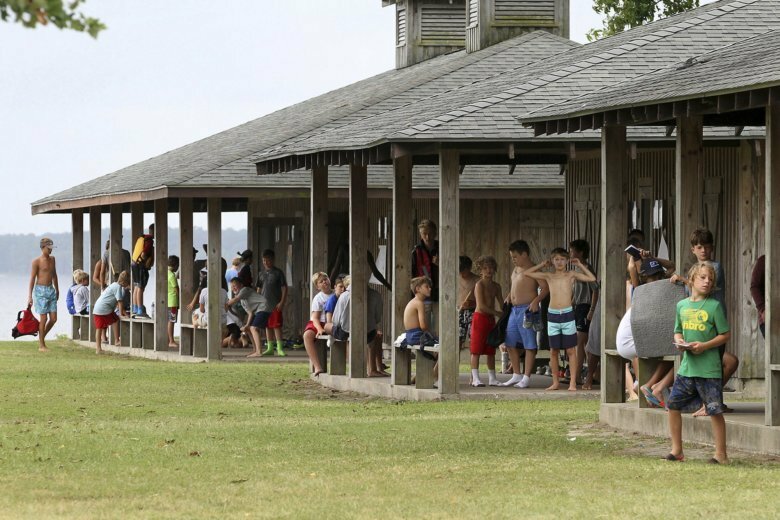 NEW YORK (AP) — If teens are so attached to their phones and all things connected, why do so many of them wind up in no-device summer camps with smiles on their faces? Thirteen-year-old Daniela Blumenfeld of Scarsdale, New York, just finished her fifth summer at sleepaway camp with no devices beyond a simple iPod. “I didn’t really miss my phone,” she said, especially given camp distractions like banana boating — that is, riding a yellow, banana-shaped inflatable towed by a motorboat. America’s summer camps have gone device-free in a big way. Most sleepaway camps moved to ban personal electronics years ago, driven by the idea that campers should soak up the scenery, sports, crafts and camaraderie their parents are shelling out hundreds of dollars for, all in service to slower living and a rest for their still-developing brains. But the big news may be that many kids seem not to mind at all. About 90 percent of the nearly 8,400 sleepaway camps counted by the American Camp Association are now device free, though some allow limited time with screenless iPods and other internet-free music players. A few teen-only programs provide cabin Wi-Fi and will let smartphones, laptops or tablets through the door so long as they’re kept in cabins and bunk areas. Some camps provide scheduled computer and internet time — partly for coding, app development or website design classes built into their curricula, and partly for limited time on games such as the immensely popular Fortnite, an online multiplayer survival/shooting experience. Among other things, camps don’t want to be responsible for loss or damage to pricey technology brought from home, despite sneaky helicopter parents who mail phones in care packages and equally sneaky campers who stash them in their bunks. Sometimes reverse psychology helps. Nigel Watson, camp director at the French Woods Sports and Arts Center, a high school-only sleepaway camp in the Catskills near New York, recalls spending his days at previous jobs confiscating smartphones and his evenings calling parents to report infractions. “If you found one, they’d have another. Some brought three to camp. It was almost where I needed a full-time policeman to take care of it,” he said. At French Woods, though, Watson lets kids use phones and other devices in their cabins, but nowhere else, so long as they power them down at lights-out. His surprising finding: The phones often end up in a drawer after a few days at camp. “They’re more often than not just comfort blankets,” Watson said. Daniela’s 15-year-old sister, Liat, who once spent two weeks at the French Woods program, reported something similar during a recent three-week teen tour of Thailand. “It was so fun,” she said of the trip. “I wasn’t craving phone time. I think since I did have it I wasn’t as obsessed with using it.” Liat considered it a relief to step away from the grind of social media and texting. Daniela and Liat are now vacationing in Israel with their two sisters and parents. Their phone use has picked up speed, said mom Ilanit Blumenfeld. For other kids, device-free camp also serves as a valuable, if brief, time-out from games, social media and other increasingly persistent digital distractions. Caleb Santana, an 11-year-old from North Babylon on New York’s Long Island, just spent a week at a sleepaway Christian camp in the Pennsylvania woods. That meant no Fortnite. Caleb, one of four kids, said it was a breeze, although a longer break might have been a problem. But he’s making up for lost time now that he’s home. Daniela said that going phone-free at camp was easier since most of her friends were also away at tech-free programs and not all over text and social media. “There’s nothing really to see on my phone,” she said. One of Daniela’s camp friends had smuggled in an iPod touch — basically an iPhone without a cellular connection that can connect to Wi-Fi for social media, FaceTime video chat and more. While the girls were on an off-campus trip they found Wi-Fi and Daniela surprised her parents with a quick call. The other girls did the same, she said.